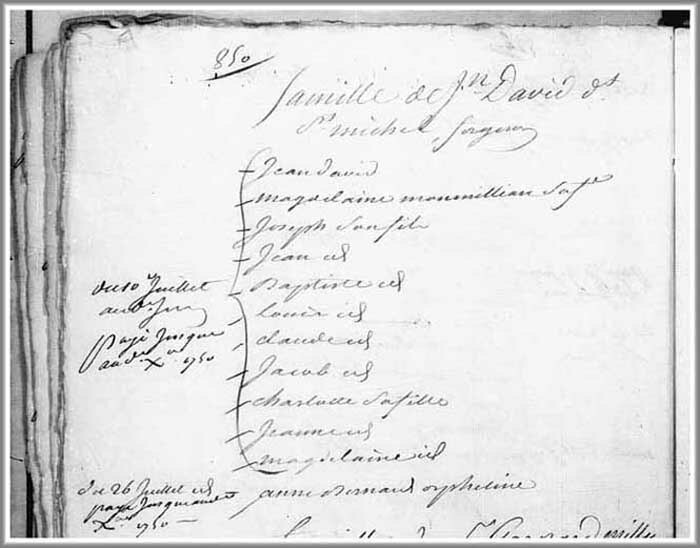 Jeanne Olive David, 4th daughter and 13th child of Jean Pierre David and Marie Magdelaine Monmellian, was born on 10 July 1739 at Louisbourg and baptized the same day. Jeanne Olive's godparents were Gille Burett, captain of the ship in this port and Jeanne Durand. Fre Athanase Guegot, Commissioner Parish Priest presided at the baptism. The witnesses attending Jeanne Olive's baptism were Elizabeth Rand, Jean Baptiste Doret, Jane Durand and Buret . The last 2 of Jeanne Olive's siblings to be born at Louisbourg were Marie Magdeleine born on 16 January 1741 and Jeanne Angelique born on 21 December 1743. 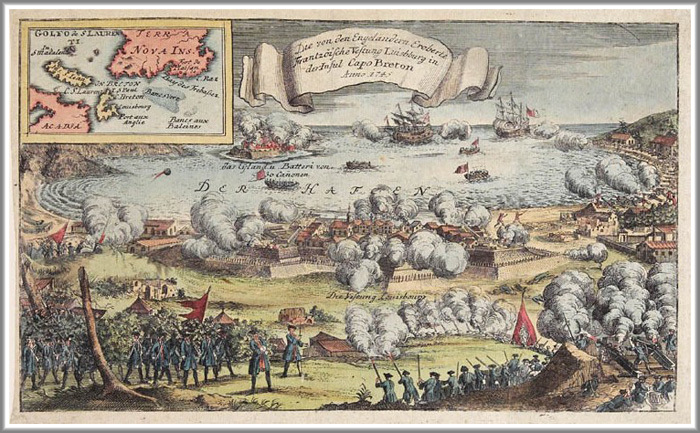 On 26 July 1758, the British finally succeeded in capturing the Fortress of Louisbourg during its 2nd and final siege. The terms of that capitulation of the fortress mandated that all captured military personal and remaining Acadian inhabitants be immediately deported to either England or France. Jeanne Olive had reached her 19th birthday just 2 weeks prior to the siege and would follow her older sister, Charlotte's lead to care for their father, Jean Pierre, during this time of grave uncertainty. Exactly how they dealt with this tragedy and what transpired over the next 9 months may never be known but accept the challenge to survive they did. On 28 April 1759, Charlotte, her new husband, Jean Pierre DeBroise, his 2 children, Marie and Guillaume Andre by a previous marriage, Jeanne Olive and Jean Pierre make their initial arrival at the port of La Rochelle, France on their way to their final destination at St Milo on 17 September 1759. A primary source manifast recording their arrival in France confirms this occurance. It is unknown which ship carried them to France but it was one of the last deportation ships departing Louisbourg after the 2nd siege. Unfortunately after close review of the passenger manifast, and if truth be known, it appears that their father, Jean Pierre, is listed in a group of passengers that may have died during this voyage and were "mort en arrivant", i.e., "dead on arrival". The 1759 passenger manifast is the last primary source recording uncoverd to date of Jean Pierre. Source: “The Acadians in France”, Volume III, Edited by Milton P. Reider, Jr. and Norma Gaudet Reider, Published Metarie, Louisiana, 1973, page 54. MARIE DE BROISE, 14 years, daughter of the first marriage of Jean Baptiste. GUILLAUME ANDRE DE BROISE their son, 10 years. JEANNE DAVID, 19 years, sister of Charlotte. Note: Guillaume Andre DeBroise was not Charlotte’s son with Jean Baptiste. This is an error. He is Charlotte’s stepson. Evidently their ship, the Duke William, first landed at La Rochelle and then proceeded up the French coast to the St. Malo area. St. Servan is just slightly south of the port of St. Malo. During the next 4 years the family, including Jeanne Olive, struggle to exist in Saint Servan and are listed in the 1762 and the 1763 Census of Acadians in Saint Milo or Saint Servan, France. However, reinforcing the theory of his death at sea during the 1759 deportation from Louisbourg, Jean Pierre is not listed in either census. Source: “The Acadians in France”, Volume I , Edited by Milton P. Reider, Jr. and Norma Gaudet Reider, Published Metarie, Louisiana, 1973, page 9. GENERAL ROLL OF THE INHABITANTS OF Île ROYALE AND ISLE ST. Note Charlotte’s first husband Nicholas Colin, a cannoneer, died 17 November 1757 in Louisberg. There is no record of children from her first marriage. Charlotte was listed as married to Jean Baptiste DeBrois in a 28 April 1759 Louisberg record of deportees to La Rochelle. The boy and girl are children from Jean Baptiste’s first marriage to Francoise Couarde who died 9 March 1757. Charlotte’s sister, Jeanne, is probably her sister Jeanne Olive (b. 1739) as opposed to her youngest sister, Jeanne Angelique (b. 1743). Despite 10 years of marriage with two different husbands, Charlotte had no children of record, an indication that she was probably barren. Did you see this entry on page 76 of Larin's book? Dès Décembre 1762, Jean-Baptiste DeBroise, un ex-inhabitant de Île Royale , avait offert de vendre au roi son brigantin , le Marie-Francoise, de transporter en Guyane ses compatriotes réfugiés avec lui à Saint-Malo et de bâtir un moulin à scie dans la nouvelle colonie. L'intendant Chanvalon avait refusé de payer le prix demandé pour le navire mais il avait fait obtenir au promoteur un prêt du roi de 14,000 livres afin de l’aider à réaliser son projet. Parti de Saint-Malo le 23 septembre 1763, Debroise s’était rendu à Rochefort d’où le 12 octobre, il s’etait joint à un convoi partant pour la Guyane. Il installa son moulin à Château Vert, près de Kourou, où il fut trouvé mort en septembre 1764. Sa veuve, Francois David, 35 ans, fille de Jean David et de Madeleine Montmélian, ainsi que son neveu, Jean Arselin (Asselin), 9 ans, se trouveront parmi les quarante passagers revenant de Cayenne qui, le 3 septembre 1765, débarqueront à La Rochelle du navire le Scipion. While the recruitment of Choiseul beat effectively full and that the volunteers by the thousands to leave Guyana, those Acadians who had accepted the propositions that they had made had organized themselves with the help of King and arrived in French Guiana by small groups. From December 1762, Jean-Baptiste Debroise, a former inhabitant of Île Royale, had offered to sell the king his brigantine, the Mary-Francoise, transport in Guyana with his fellow refugees him in Saint-Malo and build a sawmill in the new colony. The intendant Chanvalon had refused to pay the asking price for the ship but it did get a loan to the developer of the King of 14.000 pounds to help make his project. From Saint-Malo on 23 September 1763, Debroise went to Rochefort where on 12 October he had joined a convoy leaving for Guyana. He set up his mill on Castle Green, near Kourou, where he was found dead in September 1764. His widow, Francois David, 35, daughter of Jean David and Madeleine Montmélian and his nephew, Jean Arselin (Asselin), aged 9, were among the forty passengers back from Cayenne, which, on 3 September 1765, landing in La Rochelle Scipion of the vessel. Here's another J.B. DeBroise reference from Larin's book which I came across. Besides being a blacksmith, the man was obviously an accomplished shipbuilder. Poor Charlotte. She had terrible luck with husbands. Her first husband died after five years and her second after six and I could never find any record of her having children of her own. moulin à scie à Château Vert, près de Kourou, où il sera trouvé mort en septembre 1764.
l’épinette était très recherché en charpenterie de navire. On 12 October 1763, Jean-Baptiste Debroise, former resident of Île Royale, left for Guyana on his own ship with a group of Acadians in Saint-Malo. He built a sawmill in Green Castle, near Kourou, where he was found dead in September 1764. In the previous spring, he had convinced the intendant Chanvalon of the usefulness to go collecting spruce on the coast of Canada. When making "curves", the spruce wood was highly prized in ship carpentry. Jean Pierre possibly died in Guyana between the 2 marriages of JEANNE OLIVE. 12 October 1763 - Jean Baptiste joins convoy at Rochefort leaving for Guyana. September 1764 - Jean Baptiste sets up mill on Castle Green, near Kourou, where he was found dead. Jeanne Olive's father and mother are referenced in this primary source record of Jeanne Olive's 1st marrage. It specifically indicates that her mother, Marie Magdelaine Monmillion, was deceased at this time, however, it is vague as to whether her father, Jean Pierre, was alive at the time of this marriage. 3 September 1765 - Jeanne Olive's sister, Francoise Charlotte, and Charlotte's nephew, Jean Arselin (Asselin), aged 9, are among the forty passengers arriving at La Rochelle from Cayenne on the vessel, Scipion. Jeanne Olive's father and mother are also referenced in this primary source record of Jeanne Olive's 2nd marrage. It specifically indicates that her father, Jean Pierre, and her mother, Marie Magdelaine Monmillion, was deceased at the time of this marriage. Jeanne Olive’s 1st husband, Pierre LeClerc died 11 April 1767. They were married just 2 ½ years at the time of his death. Whether or not Pierre and Jeanne Olive had any children during this short marriage is yet unknown. Jeanne Olive’s 2nd marriage to Guillaume Pacquenault on 25 May 1768 in Cayenne. And it lists Jean David and Madelaine Montmillan. Looks like the portion of the record that states “…. fille ete fin Sieur Jean David et Madelaine Montmillan, ses pere et mere,…..”, i.e., “….daughter of the late Sieur Jean David and Madelaine Montmillan, her father and mother,……” confirms that Jean was also deceased at the time of the Jeanne’s 2nd marriage. Here’s the direct link to page 1 of the imaged register. This marriage record is #429 and can be viewed on page 10 of the register. Cajetan Louis, a son born at Cayenne, French Guyana on 11 February 1771. Petrouille Francoise Rose, a daughter born at Cayenne, French Guyana on 11 June 1774. Marie Claudeline Adelaide, a daughter born at Cayenne, French Guyana on 6 February 1780. Jean Marie Simeon, a grandson born at Cayenne, French Guyana on 16 January 1809. Louis Henry Eugene, a grandson born at Cayenne, French Guyana on 10 October 1811. Jeanne Olive dies in Cayenne 4 July 1805. Probably nevering seeing any of her siblings again. The dates in the death table is in the French Republican Calendar format. The month is 16 Messidor au 13 and translates to 4 July 1805. And that's exactly when Jeanne Olive died at the ripe old age of 65, 6 days short of her 66 birthday. Below is the link to the 1805 Cayenne, French Guyana death register. Her death record is 1st record on the left side of page 13. Talk about looking for a needle in a hay stack. What was confusing is that her 2nd husband, Guillaume Paguenault at this time was a royale notary and his name appears in just about every record during this period. Note: Below are listed abstracts documented in the Archives Library of the Fortress of Louisbourg. It has yet to be determined if the Jeanne David listed in the abstracts is the same Jeanne Olive daughter of Jean Pierre David dit Saint Michel and Marie Madeleine Monmillion or could it be her sister Jeanne Angelique David. 1. Cajetan Louis, a son born at Cayenne, French Guyana on 11 February 1771. His date and place of death is yet unknown. 2. Petrouille Francoise Rose, a daughter born at Cayenne, French Guyana on 11 June 1774. Her date and place of death is yet unknown. 3. Marie Claudeline Adelaide, a daughter born at Cayenne, French Guyana on 6 February 1780. Her date and place of death is yet unknown. 4. Jean Marie Simeon, a grandson born at Cayenne, French Guyana on 16 January 1809. His date and place of death is yet unknown. 5. Louis Henry Eugene, a grandson born at Cayenne, French Guyana on 10 October 1811. His date and place of death is yet unknown.